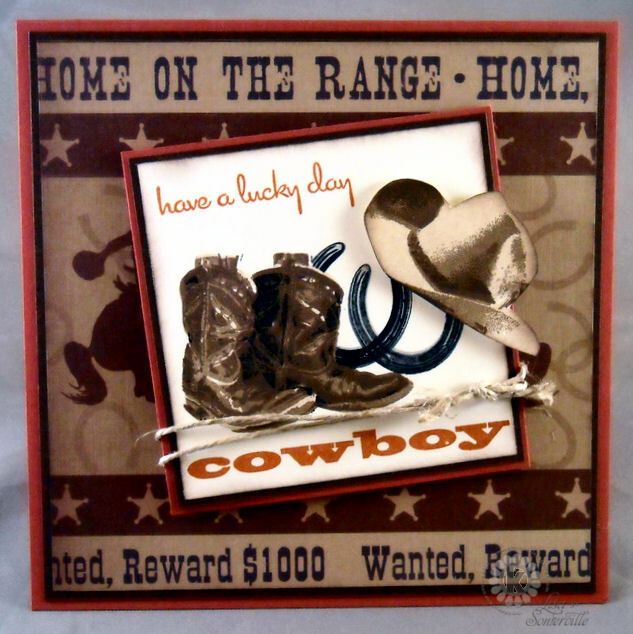 Designs by Lisa Somerville: Have a Lucky Day Cowboy! Have a Lucky Day Cowboy! Okay, so you can get your mind out of the gutter, it's not what you think - it is however Kitchen Sink Stamps Monday! Hope you had a great weekend, we celebrated our DS 17th BD over the weekend, gosh where does the time go! Our Lab thought Jim needed help opening his present! Today's card was created for last weeks KSOC in the Kitchen Sink Stamps Forums. If you have Kitchen Sink Stamps, we'd love to have you join in on our Daily Challenges, and see your creations uploaded in the Kitchen Sink Stamps Exclusive Gallery! How sweet is that picture of Lou helping Jimmy. :) Love your cowboy cards and this is no exception. Wonderful design! Rustic and handsome card! I love this awesome card, Lisa! What a fabulous design!! Awesome masking and shading!! What a fantastic Western theme card Lisa!! I love the mix of those sets! Happy Birthday to your DS! I celebrated my DD's birthday over the weekend too :):)Kids grow up so fast don't they? Hope Jim had a great birthday. I see your puppy did. Great Card. You do the Western cards so well. (Like everything else you do). I love the hat hanging on the horseshoes. So cool. I just never get over how real KSS images are! You do such a beautiful job with them, Lisa! This is so real lookin' partner, luv the hat hanging on the boots! Great card and hope Jim had a great birthday, looks like you all had a fun time. This is phenomenal! It is amazing how you put all of the stamps together to make such an incredible card! And, Happy Birthday to your DS! Fantastic, love the western theme. Oh Lisa! I so love the dimension on this card...WOW!! How cute your son and lab are too! Oh how I miss my lab!! Hugs!